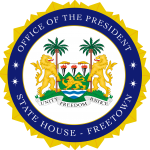 Freetown, Sierra Leone, Wednesday 10 October 2018 – Newly approved Ambassadors and High Commissioners have taken leave of His Excellency President Julius Maada Bio at State House, in readiness to take up their respective assignments abroad. Presenting the diplomats to the President, Minister of Foreign Affairs and International Cooperation, Dr Alie Kabbah, said the purpose of diplomacy was to seek and protect one’s home country’s interests within the host nation. He disclosed that they were pleased with the calibre of people that were appointed to represent Sierra Leone in foreign countries, adding that the appointees were the best crop of diplomats to represent, build and rebrand the image of the country. “These are the best sets of diplomas ever in the history of diplomacy in this country. They have had some of the best training on the purpose of their job and are ready to accept the difficult challenges that lie ahead of them,” Dr Kabbah said. Making a statement on this occasion, President Bio congratulated the Ambassadors and High Commissioners for having gone through parliamentary approvals and the training organised by the Ministry of Foreign Affairs. He urged them to accept the many difficult challenges in rebuilding a new Sierra Leone, particularly in foreign countries. “Collectively we are going to take the challenge and we will leave a global footprint at the end of the day,” he said and cautioned the departing Ambassadors and High Commissioners. He further assured them of his continued support to make their work, overseas, comfortable, but advised them to embark on economic diplomacy that would be attractive to foreigners and investors. On behalf of the diplomats, Ambassador to Germany, Dr Mbaimba Bayoh, thanked the President for placing the highest amount of confidence in them to represent the country in foreign lands. He said that they had accepted the offer with humility and noted that their appointment was a big national responsibility but also a great opportunity to serve their country overseas. Ambassador Bayoh also assured the President that all the Ambassadors and High Commissioners would work assiduously to add on to nation building, thereby finding ways to support the flagship programme of the government – free and quality education – and also other areas that were lacking in the country.